Don’t Join The Naysayers And Handwringers . 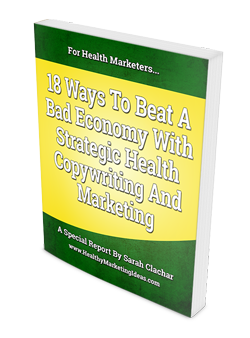 . .
Sarah Clachar’s report, 18 Ways To Beat The Bad Economy With Strategic Health Copywriting And Marketing, went way beyond what I had expected. It has the heft and clarity of insight one would expect from a heavyweight industry analyst. This speaks volumes about Sarah’s value as a writer and copywriter in the field of natural health. She not only knows how to write well and persuasively, but also bases her work on solid, verified sources. Some health writers know how to sell, others understand the science, very few can do both. Sarah is one of those few. People need your natural health products now more than ever – and they’re willing to pay for them. In fact one of my clients with a very nicely priced product gets love letters all the time from people saying how they adjust their budget to make room for this product – they love it so much. Now, more than ever, people are looking for alternatives that bring results in their lives. However, too many businesses have accepted that the grim reality of a tough economy means dropping prices and more sales to keep customers. That’s why I put this report together. To give you options and ideas. To help you make your business as strong as ever during this economy. Many of these strategies are simple, easy to implement and even low-cost themselves. But they can make a difference in your bottom line – anenormous difference. Three insights into how health consumers think about health products during a recession that can help you better position your products (and feel more optimistic about the months to come). 9 suggestions for strategically using copy to remove focus from the price and put it where it should be – what you offer and why your customer’s shouldn’t purchase from anyone else but you. PLUS – 6 Bonus tips for countering the growing skepticism that comes with tight budgets. These tips – drawn from my ebook, Writing Irresistible Copy for Nutritional Supplements, published by master copywriter Bob Bly – will help you build your credibility like a brick wall. This report gives you a truckload of tactics to help you find holes you can fill, angles you can build on and uncut jewels you can make shine in order to bring in more customers and keep them for your natural health business. Don’t sell your business short. Get your copy of this free report now . . . and find out what you can do to set your business apart. P.S. Many of the tactics covered in here are as old as the hills, tried and true. But forgotten, unfortunately, trampled in the stampede to offer things at a discount. Don’t go this route unless absolutely necessary. Give yourself a full toolbox of tactics to make your potential customers an offer they can’t refuse and will continue to stick with well into the future. Get your free report now. Sarah Clachar helps natural health businesses grow through strategic copywriting and marketing. Author of the ebook “Writing Irresistible Copy For Nutritional Supplements,” published by master copywriter Bob Bly, Ms. Clachar has written for a variety of companies in a number of different formats, online and off. Her clientele includes Sun Chlorella, Lombardi Publishing, Pomegranate Health, Vitacost, Vitakem, 1800Healthy.com, BioActive Nutrients and more. When she’s not helping her clients get more customers and sales, she spends time with her husband and two kids tending their small organic farm, mountain biking and practicing mixed martial arts.